New Orleans (CNN) – Rep. Ron Paul sure knows how to draw a crowd. Extra chairs were brought into the already packed hotel ballroom where the Republican Leadership Conference is being held to accommodate a swarm of loud and energetic supporters of the longtime congressman from Texas, who is making his third bid for the White House. And those supporters loudly applauded Paul throughout his address, as he preached against American involvement in overseas wars and alliances by saying, "Americans are sick and tired of no-win wars around the world." Paul also argued against the government's monetary policy, against the Federal Reserve, and against too much government regulation, saying "the fact that we have too many laws is what the problems are." And he used his speech to tout civil liberties and family values, declaring that "rights and liberties come from your God, not your government. Besides, government is not very good at teaching morality." Paul polls in the low double digits or high single digits in most of the recent national surveys in the battle for the GOP presidential nomination, but some pundits handicap his chances of wining the nomination because they criticize him as being out of the mainstream GOP because of his philosophy. But Paul started and closed his speech by saying that most Republicans are beginning to see things his way, saying that they are "starting to use our language." 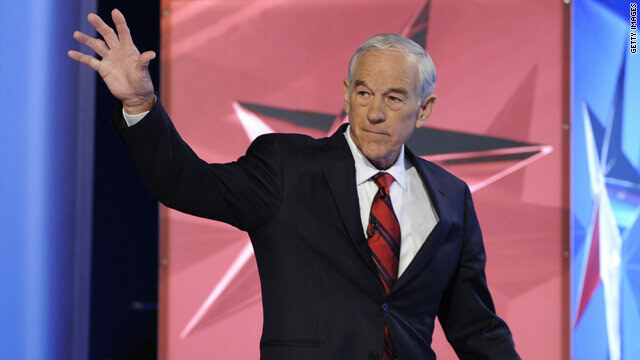 "Paul polls in the low double digits or high single digits in most of the recent national surveys"
...I think Ron Paul will surprise many people with his showing in the primaries. He has the support of many democrats who are fed up with the war policies of the current administration. Many of them have already changed party afiliation. He also has the support of many real conservatives who are opoosed to an interventionist foreign policy. He has supporters across all age groups. He may very well win the nomination or have enough delegates to have an impact on the policies of the nominee. these comments hurt my eyes. – him being christian has nothing to do with anyone elses way of life. its more or less the golden rule that he applies. – stop lying about dr. paul... he has more character in his little finger than any other candidate and he would bring this country back to prosperity and FREEDOM. Marie MD, if you think Paul has ever argued "the wars were okay as long as it's not a democratic president," you are just plain not paying attention or deliberately working to mislead others. Ending these foreign military entanglements was one of the very biggest themes of his presidential run in 2008, while under a Republican president. In fact, it's been part of his extremely consistent principles over the multiple decades he's been serving the nation. Oh, yeah.... Ron Paul is really a kook. Who in the their right mind would be for a smaller government, less regulations, repeal of the Patriot Act, elimination of the DHS and TSA, ending the Fed so we could print our own money without having to borrow from the Globalists trying to take over the world, restoring Prosperity, restoring Freedom, and restoring PEACE by ending all the wars and bringing our troops home. He wants to abide by the laws of God and the Constitution. MAN, he is REALLY A KOOK. You must be nuts to vote for RON PAUL! Scarlett, have toy actually looked at any poll results, or are you just fabricating numbers? This is the problem I have with Ron Paul. God has nothing to do with my rights and liberties. Sounds like Paul wants to shove his religion and values down my throat. How is that liberty? How am I free if I have to live up to Ron Paul's standards? What about Americans who may not be religious? Keep God and religion out of politics! Grassroots is not having to pay for your supporters! Ron Paul and his racist buddy Lew Rockwell – no thanks!